Authors often use headings and subheadings to structure their argument. When used effectively, these signals can help guide readers through a long argument. SBLHS 2.1.3.1 provides basic guidelines for formatting headings and subheadings (see also CMS 1.55–1.57). This post will expand those guidelines and provide examples. Since the ultimate goal of headings and subheadings is to increase reader comprehension, authors should take care to establish a clear and consistent hierarchy. Use a maximum of three levels; more can be confusing and overly complicated. When possible, use parallel grammatical constructions. The number of headings and subheadings can vary per chapter or article; however, when either are used, it is preferable to use at least two headings or subheadings per level. If a chapter begins with an introductory paragraph, an initial heading (“Introduction”) is unnecessary. Although not all works need to number headings and subheadings, numbered headings and subheadings can be a helpful way to orient the reader, especially when a work includes cross-references. It is preferable to include a descriptive title along with the numbered heading, as in 3.1. Communication with Enemy, rather than just 3.1. In this system, sections are numbered within chapters, subsections within sections, and sub-subsections within subsections. The number of each division is preceded by the numbers of all higher divisions, and all division numbers are separated by periods, colons, or hyphens. Thus, in the example above, the number 3.1 indicates that “Communication with Enemy” is the first section of chapter 3. In this system, the chapter is the first numbered level. 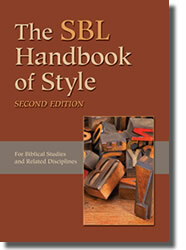 For ease of cross-referencing, SBL recommends that one begin numbering chapters with the introductory chapter (i.e., 1. Introduction, 2. Casus Belli, 3. Preparation for War). SBL recommends using only arabic numerals; we discourage the use of roman numerals or letters (3.1, not 3.A or III.A). Although CMS permits periods, colons, or hyphens, SBL prefers to use a period + one space to separate the number from the descriptive title. Headings and subheadings should be concise, fitting, if possible, on one to two lines of printed text. Although some publishers abbreviate ancient texts in headings and subheadings, SBL Press prefers that the titles be given in full, unless doing so produces an unwieldy heading. References within parentheses may be abbreviated following the guidelines of SBLHS 8.2. Avoid ending a heading or subheading with a period, comma, or colon. Relationship between the Crown Prince and His Father. Avoid attaching footnote callouts to any headings or subheadings (CMS 14.27). When possible, move the footnote callout to end of the first sentence of the main text instead. Reword the footnote as necessary.